Surfers gliding through waves filled with plastic in Indonesia. The world’s largest landfill in the middle of the ocean, a vast area otherwise deemed the “Great Pacific Garbage Patch.” Sea birds ingesting large amounts of plastic that are later unable to eat. Sea turtles eating large amounts of plastic mistaken for jellies, one of their favorite snacks. News articles on plastic trash in the ocean. A surfer surrounded by trash in Indonesia (left; source: http://www.huffingtonpost.com/2013/08/10/trash-waves-indonesia_n_3736913.html), a dead albatross found on Midway Atoll with a stomach full of plastic (center; picture by Chris Jordan; source: http://www.npr.org/2014/06/17/322959714/plastics-dont-disappear-but-they-do-end-up-in-sea-birds-bellies), a sea turtle eating plastic debris (right; source: http://www.mnn.com/earth-matters/animals/blogs/rare-sea-turtles-eating-plastic-at-record-rate). One angle of plastic pollution often overlooked by the popular press is how trash finds a way into the deep sea. Plastics are commonly thought of as a pollution issue confined to the uppermost layers of the ocean that humans are able to access and observe. However, a large proportion of industrial plastic is negatively buoyant, or does not naturally float in water. A growing body of research supports the idea that the deep sea is indeed accumulating large amounts of plastic and other types of trash. For example, researchers at the Monterey Bay Aquarium Research Institute, found a plastic potato chip bag at 3,506 meters depth (11,503 feet down into the murky darkness of the ocean) using remotely operated vehicles in Monterey Canyon! Recently, scientists attempted to conduct a global survey of how much plastic might be in the world’s oceans and found that a substantial portion seems to have gone ‘missing’. The scientists hypothesized that much of this ‘missing’ plastic has sunk into deeper waters. Although humans are far removed from and don’t often show immediate concern for the deep sea, deeper waters off of the continental shelf comprise the largest and one of the most important habitats on the planet. Thus, if these deep waters become inundated with plastic debris deep sea animals are likely to face other unforeseen consequences. So, how would large amounts of plastic and other trash ‘disappear’ in the deep ocean? Due to inherent physical properties some will naturally sink but what about the rest? Mixing from wind and waves and strong storms can send pieces into deeper waters. Small animals that settle onto plastic can cause them to sink. Deep-diving animals feeding on plastic may ingest them in shallow waters, swim down into deeper waters, and be eaten by other deep-living predators. Video of a longnose lancetfish at 1235 meters in Monterey Bay captured by MBARI. This open ocean swimmer can be found in all oceans except the polar seas, can grow to 2 meters (6.6 feet) long, and has been found to regularly eat plastic. A food chain type of mechanism delivering plastic to the deep sea may seem far-fetched but researchers are finding evidence that this may be how some of that ‘missing’ plastic leads to deep sea animals. For example, researchers in Hawaii found buoyant plastics in the stomachs of fish not known to swim and forage in shallow waters where buoyant plastics first originate. These fish species include the opah (or moonfish, Lampris guttatus) and the longnosed lancetfish (Alepisaurus ferox). The lancetfish is a ferocious snake-like fish that can be found down to 1,900 meters or 6,000 feet. In some cases, plastic and other types of debris can make up as much as one third of these fishes diet by weight! 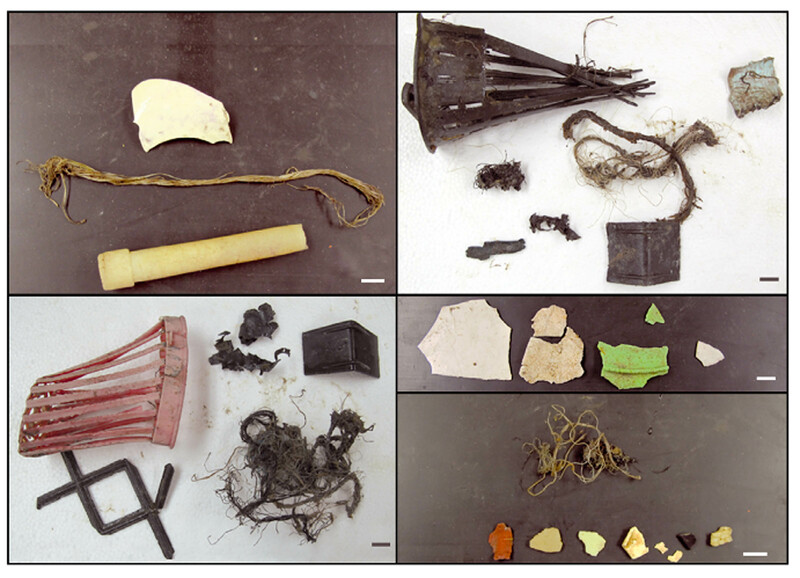 Examples of marine debris found in opah (all but top left image) and lancetfish (top left image) stomachs. Each of the five images represent debris found within 1 individual stomach. Scale bars are 1 cm. Source: Choy and Drazen 2013. Why large, predatory fish would eat such large pieces of plastic and other debris is still largely unknown. Given the great diversity of life forms in the deep sea it is certainly possible that different colors and shapes of plastic debris are mistaken for food items. A short video by MBARI of examples of marine debris items observed on deep sea ROV dives. Published in Schlining et al. 2013. With the known vulnerability of deep sea fishes (see Bottom of the Barrel – expansion of fishing to the deep sea is not sustainable) and the hazards of eating plastic trash (see Plankton or Plastic), scientists are concerned how trash might affect deep sea ecosystems. Hopefully this blog posting has shed a bit of light on a different angle of the marine debris issue. The next time you are at the store you might think twice about whether you really need that extra item and the plastic it is wrapped in. Chances are that some of that plastic will eventually find its way into the ocean and may one day be deep sea fish food. Choy CA, Drazen JC. 2013. Plastic for dinner? Observations of frequent debris ingestion by pelagic predatory fishes from the central North Pacific. MEPS 485:155-163. Schlining K, von Thun S, Kuhnz L, Schlining B, Lundsten L, Stout NJ, Chaney L, Connor J. 2013. Debris in the deep: Using a 22-year video annotation database to survey marine litter in Monterey Canyon, central California, USA. Deep-Sea Research I 79:96–105. Previous Post What creature defies science, carries your money, cleans the ocean, and produces buckets of slime? do any of these plastics that make it down to the deep depths ever make it to the thermal vents and molten lava and if they do, does this pose a whole new threat or issue?